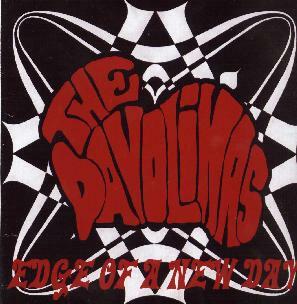 Davolinas - "Edge Of A New Day"
The Davolinas are a new hard rockin’ Danish band. The band has played quite a few concerts in Copenhagen in the last year and recently did their first concerts in Germany and received a great response. The three piece features Lene on Vocals and Guitar, Per on Drums and Anja on bass on these recordings. Anja has left the band and has been replaced by Torben (Magnified Eye). This CD was recorded in Hannover and has a great sound. The band takes simple guitar riffs, basic heavy bass and powerful drums to create a cool mix of songs. The CD starts off with the instrumental track, "Surf 11". Like the title says it is a short Surf riff rock instrumental to get you warmed up for the Heavy stuff. The title track, "Edge Of A New Day" is next and a real stoner rock style riff and fantastic vocals by Lene. A powerful and unique voice gives the Davolinas a special sound. "Exit Repression" follows and speeds things up a bit. I like the psychy guitar on this one but it is mixed a bit far in the background. Lene has a cool effect on the vocal. "Happiness Is Fragile" is a rock ballad and a beautiful one. Just lacks a solo to melt you away. "I Want You To Burn With Me" has a riff a lot like the opening and a pretty basic hard riffing track. "Nightfall" begins with a very heavy thudding bass and Lene starts in with a really cool guitar riff. "Running On The Moon" is next and another of the coolest tracks on the CD. I really like the slow building wah wah guitar before the Sabbath like riff kicks in. "Riff" is a bit basic but a cool track. "Stormy Street" has very passionate vocals and a slow pace but it slowly builds. "Gotta Connect" is a cool spacey psychedelic ballad and one of my favourites on the CD. The CD ends with "Destiny", a long slow song with some strange and wonderful guitar. Quite a cool way to finish off the CD. The riff is quite similar to the one in the song before it, "Heaven In Me", but this track takes you on a long journey. Great song. This is a damn good debut and a great collection of songs. A bit more variety and less basic guitar and bass riffs combined with some lead guitar and this band would really blow the doors off the place! For more information you can visit the Davolinas web site at: http://www.davolinas.dk. Visit the Swamp Room Records web site at: http://www.swamp-room.de.